D-Link has launched the DAP-1860, their new AC2600 Wi-Fi Range Extender. “More connected devices means a greater need for a strong reliable connection covering the entire home,” said Graeme Reardon, Managing Director of D-Link ANZ. The AC2600 extender is equipped with D-Link’s unique Whole Home Wi-Fi technology that includes four high-performance external antennas and high-power amplifiers designed to optimise coverage and maximise range, eliminating wireless dead zones in hard-to-reach areas like upstairs bedrooms and outdoor areas. 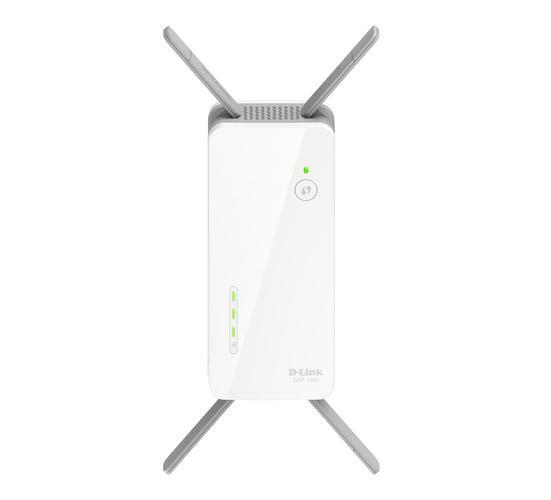 The D-Link DAP-1860 can extend the wireless coverage of any WI-Fi router, however, when paired with a D-Link PowerZone enabled router or modem router, enables a mesh solution with a single network name across the entire home, creating a seamless, high-performance Whole Home Wi-Fi experience. The DAP-1860 Wi-Fi Range Extender comes packed with advanced features including dual-band connectivity with speeds up to 2600 Mbps, Advanced AC SmartBeam to enhance signal strength, and a Smart Signal Indicator to guide users to find the best placement for optimal coverage. For added performance, the AC2600 Extender incorporates the latest multi-user MIMO technology that enables simultaneous transmission to groups of clients, making more efficient use of available Wi-Fi network capacity and speeding up transmissions. Like all D-Link’s Range Extenders, the AC2600 Extender features a simple one-button installation - users need only press the WPS button on the Router and then on the Extender to sync and instantly increate the coverage of a wireless home network. Users whose Routers do not have a WPS button can use a web browser or D-Link’s free mobile app for simple setup. The D-Link AC2600 Wi-Fi Range Extender is available from www.dlink.com.au for $249.95, www.dlink.co.nz for NZ$299.99 and from all authorised D-Link retailers and resellers in Australia and New Zealand.